10th Anniversary of TEA Party April 15th! Click HERE to find a TEA Party Anniversary Rally/Event in NE Ohio or Anywhere in the US! If you Don’t have a Gadsden Flag/Banner Click HERE to Print your own! Did you know that polls show as many as 23% of Ohio voters support the goals of the TEA Party Movement! All American’s should because the TEA Party is fighting for better government and more individual Freedom and Liberty for everyone! April 15th is the 10th Anniversary of the TEA Party Movement! Let’s Celebrate our Achievements in STYLE !!!! Create Your Own Event with the Help of TEA Party Patriots! the weekend of April 13-15! Click Here to get Your Commemorative 3′ x 5′ Banner/Flag by making a Donation! 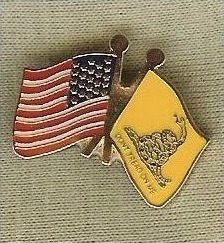 Start wearing a Gadsden Pin every day! Click the Image to Order One! Mueller Report is not Justice it’s a cover up!